Team members (from left): Alesha Sledge, Rebeca Espinoza, Raquel Maldonado, Melisa Escobedo, Areli Mendiola, Stephanie Bennett, and Ashley Mercer. 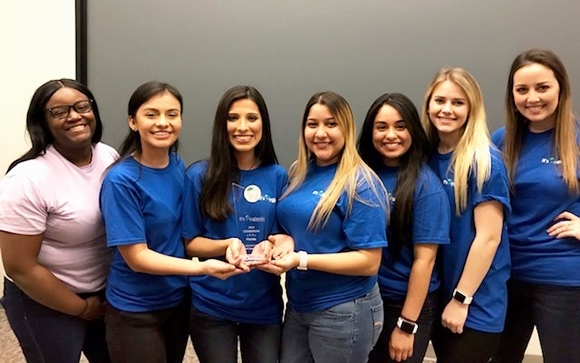 AVON PARK, Fla. – Feb. 4, 2019 – South Florida State College (SFSC) students showed off their knowledge of dental hygiene and took first place in the It’s Hygienic competition, on Saturday, Feb. 2, held at the State College of Florida, Manatee-Sarasota. This is the second year that the It’s Hygienic competition has been held in Florida. Last year, the two SFSC teams placed first and second. SFSC’s team, who called themselves the Flossy Posse, were presented with a trophy in honor of their first-place win. The dental hygiene students on the team were Alesha Sledge, Rebeca Espinoza, Raquel Maldonado, Melisa Escobedo, Areli Mendiola, Stephanie Bennett, and Ashley Mercer. The It’s Hygienic competition covers the National Board Dental Hygiene Examination (NBDHE) from core sciences to case study applications in a five-round, quiz show format and serves as a means to prepare students for the national exam. Other colleges participating in the It’s Hygienic competition were Broward College, Palm Beach State College, Tallahassee Community College, Valencia College, and two teams each from Indian River State College and the State College of Florida, Manatee-Sarasota. Each college fields at least one team of second-year dental hygiene students. “Our students smoked the competition,” said Bob Sconyers, dental assisting professor, who accompanied the students to the State College of Florida. “They were absolutely fantastic.” Darlene Saccuzzo, dental hygiene professor, served as the SFSC team’s mentor for the competition but was unable to attend. It’s Hygienic is part of Board Games, LLC, which was created in 2015 by Maura Ordovensky and Bianca Harris, who are dental hygiene educators. For more information on SFSC’s dental education programs, call 863-453-6661 or email recruiter@southflorida.edu.